Professor Bush spoke deeply about the theory of transformative mediation. At the core of the theory is a set of cycles involving Empowerment and Recognition, the two elements that make the world of transformative mediation go ’round. 1. Self experience: We first feel weakened, fearful, unsettled, unsure of ourselves – no more how strong and confident we may have been before the conflict. 2. Experience of the Other: We then move on to a self-absorption stage that involves discrediting the other party – because we are cloudy and unclear about ourselves, we can’t trust the other side at all. We totally alienate them. It’s a very negative experience, clearly. It gets worse as the conflict intensifies. That’s the negative conflict spiral, and it’s a cycle of disempowerment and distance. The interest here is to change the experience of the interaction. Right now, the interaction deteriorates because of the lack of competency and connection. 1. The Empowerment Shift: We go back from weak to strong, from unsettled to calm. Confused to clear. Fearful to confident and inarticulate to articulate. We are changing the interaction from the point of the Self. 2. The Recognition Shift: Only once the Self has experienced the Empowerment Shift, then the Other can be taken care of. We go from self-absorbed to attentive. Defensive to open, hostile to civil. Suspicious to trusting and closed to open. And that is when the interaction can become a positive experience, with the potential for resolving the conflict. This is Bush’s diagram of the process described. This entry was posted on Tuesday, June 26th, 2007 at 7:28 pm and is filed under lesson learned. You can follow any responses to this entry through the RSS 2.0 feed. You can leave a response, or trackback from your own site. 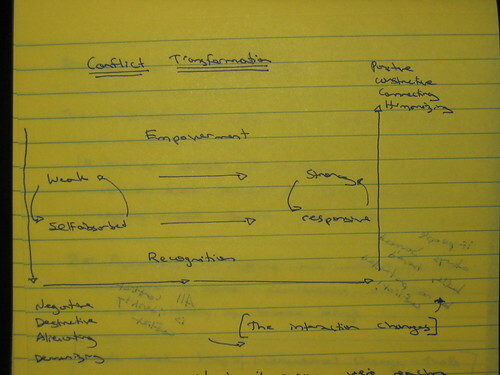 One Response to Conflict transformation, Bush-style.